A while back, I made a recipe from the cookbook Melissa's DYPs. At that time, I didn't happen to have any actual Dutch Yellow Potatoes (that's the DYPs in the book title), so I used regular potatoes. The recipe worked out well, so the cookbook is useful even if you can't find exactly those potatoes. But after hearing about the Dutch Yellows, I wanted to try them, just because I was curious. Wouldn't you know it - recently the folks at Melissa's sent me a little care package that included some Dutch Yellow Potatoes, among other things. So I started browsing through the cookbook again, and found a recipe for Picadillo that sounded good. It's a Mexican dish that's typically used to fill burritos or tacos or empanadas. Of you could serve it as is, if you like. It's sort of like the mutant child of chili and Sloppy Joes. It's definitely comfort food. 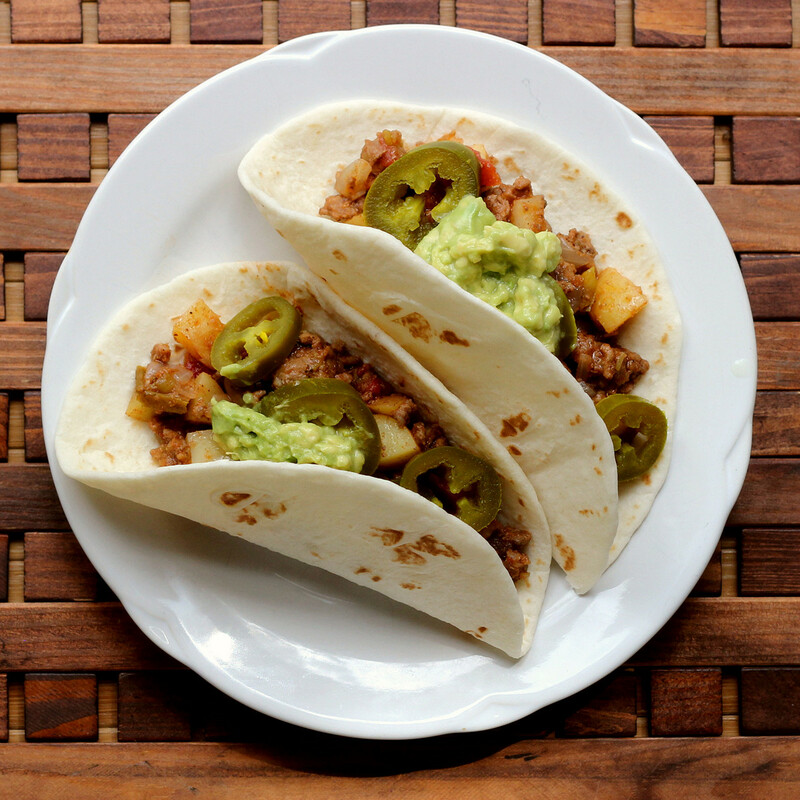 Right about the time I decided I wanted to make picadillo, I realized that I didn't have the exact ingredients the recipe called for, so I made my own version. Did I mention that care package from Melissa's? Well, along with edibles, they sent me another copy of the book. So, since I'm so nice, I'm giving it away to one of my lucky readers. Heat a saucepan or skillet on medium heat. Add the beef. Cook, stirring once in a while - and breaking it up as you do so - until it's mostly cooked through. Add the onion, peppers, and garlic. Cook until the onions are translucent. Add the tomatoes, potatoes, and adobo seasoning. If your adobo is salt-free, add 1/2 teaspoon of salt now. Cover the pan and cook until the potatoes are cooked thorough - about 20 minutes. The mixture shouldn't be very saucy since this will be a taco filling, so if there's still a lot of juice from the tomatoes, continue cooking with the lid off until most of the moisture is gone. Taste and adjust seasoning as desired. 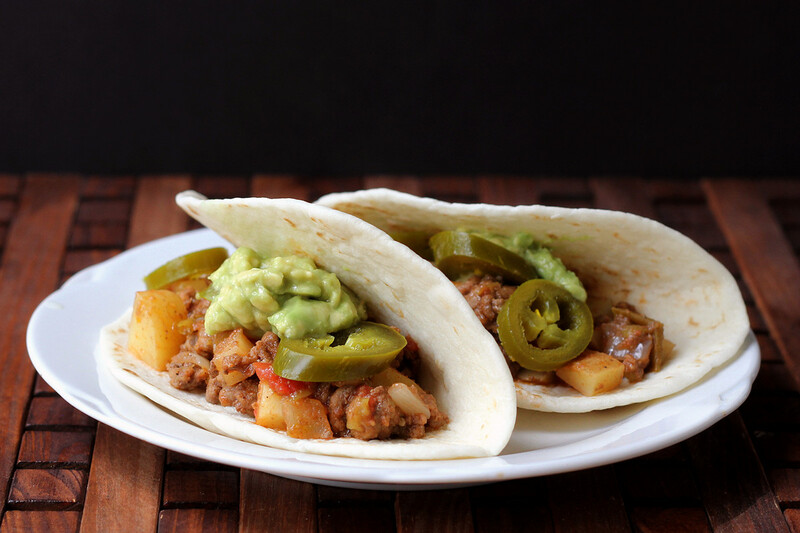 Serve on warm tortillas. Garnish as desired. I served it with pickled sliced jalapenos and guacamole. Melissa's sent me a copy of the Melissa's DYPs cookbook for my use; since I already had a copy, I'm giving one away and will ship to the winner. They also sent me a selection of produce. Your robot masters have arrived, and they want to cook dinner for you. Yep, it finally happened. I am the proud owner of a cookbook written by a non-human. A robot, to be exact. His name is Chef Watson, and his parent is IBM. Chef Watson didn't write the whole cookbook himself, though. He had human minions who helped him refine the recipes after he bequeathed them with is food combinations. While it sounds like it could be a fun thing to do, some of his food combinations were ... interesting. I browsed through the book looking for something I actually wanted to make. Like any cookbook, there are always things that are more appealing and others that are less appealing. And like many chef-driven cookbooks, this was not written with the average person's grocery store in mind. For example, a promising-looking cocktail called for banana juice, a cabbage slaw required tamarind concentrate, and a pudding recipe called for double-smoked bacon. And like many chef-driven, restaurant-like dishes, many of these required multiple components. The Belgian Bacon Pudding required sub-recipes of bacon porcini pudding, walnut financier, and spiced dried fruit compote. Meanwhile, an Italian Roast Duck recipe required pickled mushrooms, vacuum-poached apples, shaved fennel salad, duck sausage, porcini red wine tomato sauce, and black olive and dried cherry coulis. Of course, you don't have to make all of the components. Those vacuum-poached apples would be a great side dish to go along with pork or chicken. But still, it's fun to see what things Watson thought would be good to combine, even if I never make one of those very long recipes. 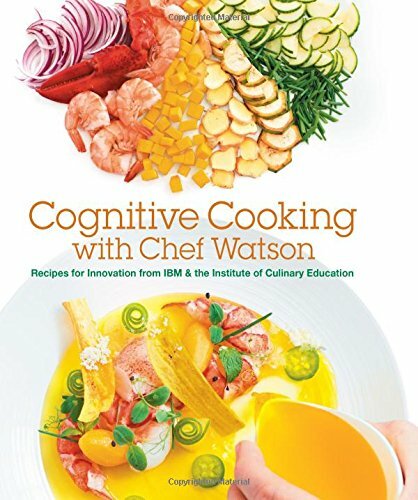 And that's the interesting thing about this book - the different foods that Watson combined to make recipes. We humans have preconceived notions about what goes with what. 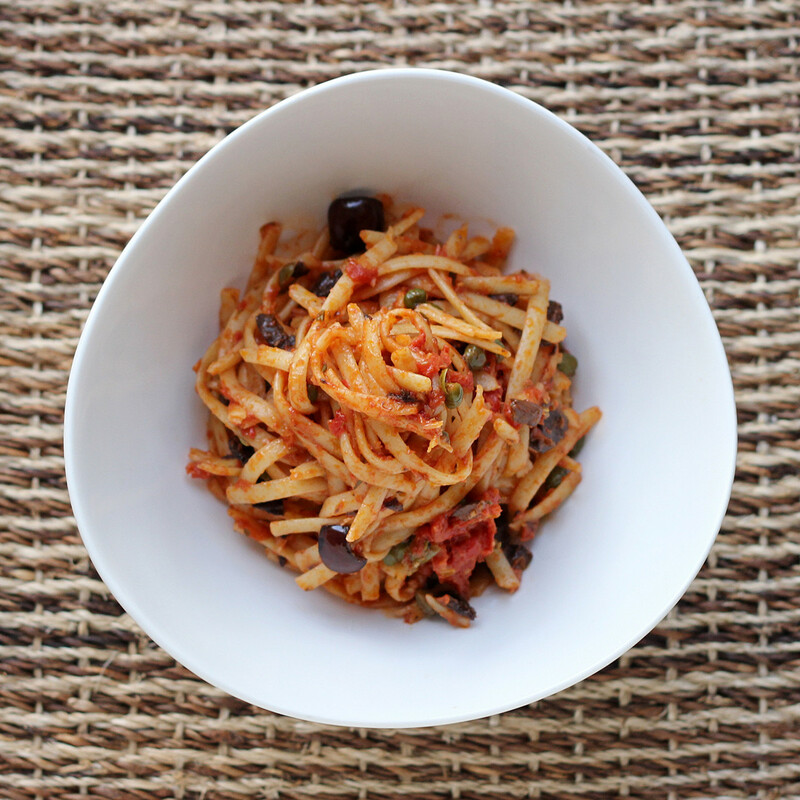 We know what flavors are in Italian foods or Mexican foods or Indian foods. Watson doesn't have those notions about what foods belong together and which don't. So Watson is comfortable combining things that our human brains might never consider. Each recipe is rated on three metrics: surprise, pleasantness, and synergy. When ingredients and flavors are not commonly combined in traditional recipes, Watson rates a recipe high on the surprise scale. Pleasantness is about flavors that give people pleasure on a molecular level, which is called "hedonic psychophysics." This metric isn't about food tasting good or bad, it's about that molecular-level pleasantness. 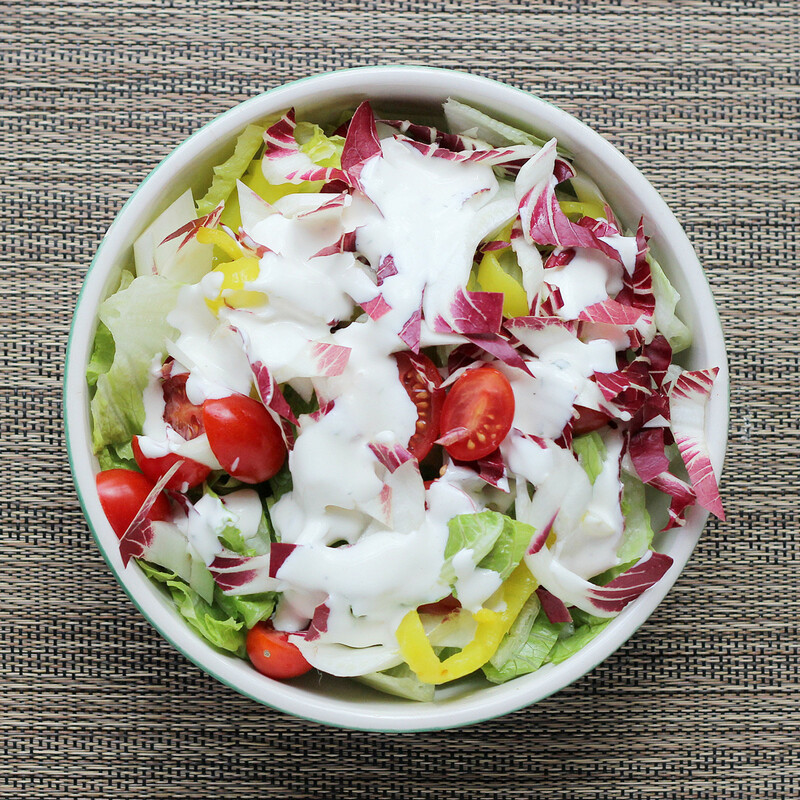 Foods that share common chemical flavor compounds taste good together, and Western dishes lean towards those sorts of synergistic food combinations. On the other hand, Asian food tend to have contrasting flavors. I browsed through the book and narrowed down my choices of a recipe to make right away. The short list was spicy tomato gazpacho with ginger; roasted tomato and mozzarella tart; fennel-spiced ribs with tangy apple-mustard barbecue sauce; grilled corn and nectarine salad with toasted spice vinaigrette, and shrimp cocktail (which is a drink with a shrimp in it). I intended on making the tomato and mozzarella tart until I went to the grocery store and saw that they had both ears of corn and white peaches. Although the recipe's name include nectarines, it says that peaches are fine, too. I would have preferred yellow nectarines or peaches just for their color, but at this time of year, I was happy to get the white ones. Although this recipe sounded like it could be good, I was skeptical. The corn and nectarines sounded quite pleasant, but I wasn't sure how the basil, rosemary, and toasted spices would fit. The first bite had my taste buds asking my brain what it was thinking. The second bite made me think it was okay, but just okay. The third bite had me taking another serving and thinking that I really, really, really need to make this again. Brush the corn with the tablespoon of olive oil, then sprinkle with salt and the chili powder. Heat your grill (or a grill pan) and grill the corn, turning as needed, until the corn is cooked and is lightly charred in spots. Let the corn cool, then cut the kernels off the cob. Toast the coriander and cumin seeds in a dry skillet over medium heat, tossing or stirring it to keep it from burning, until they're lightly toasted and fragrant. Pour them onto a cutting board. Let the cool, then chop them with a knife, grind coarsely in a spice grinder, or crush with a mortar and pestle. Whisk the lemon juice, rosemary, hot sauce, remaining 1/4 cup of olive oil in a medium bowl. Season with salt and pepper. Add the corn kernels, nectarine slices, shallot, basil, and cheese. Toss to combine and serve. There was an avocado sitting on the kitchen counter, glaring at me accusingly. I had plans for it the day before, but plans fell through. I knew that if I didn't use it soon ... like now, it would be ugly inside, and I'd be mad. For a fleeting moment, I thought about adding the avocado to the mashed potatoes I was planning, but shifted gears when I remembered the shishito peppers I recently received from Frieda's Specialty Produce. Avocado with shishito peppers sounded like a really good idea. And, it was. They added a nice roasted pepper flavor and just a little bit of heat. Remove the pepper stem and slice the peppers in half, lengthwise. Heat the oil in a skillet and add the peppers. Cook, stirring occasionally, until the peppers are browned in spots and beginning to smell fragrant. Remove the peppers from the pan and chop finely. Remove the flesh from the avocado and put it in a small bowl along with the peppers, chives, lime juice, and salt. 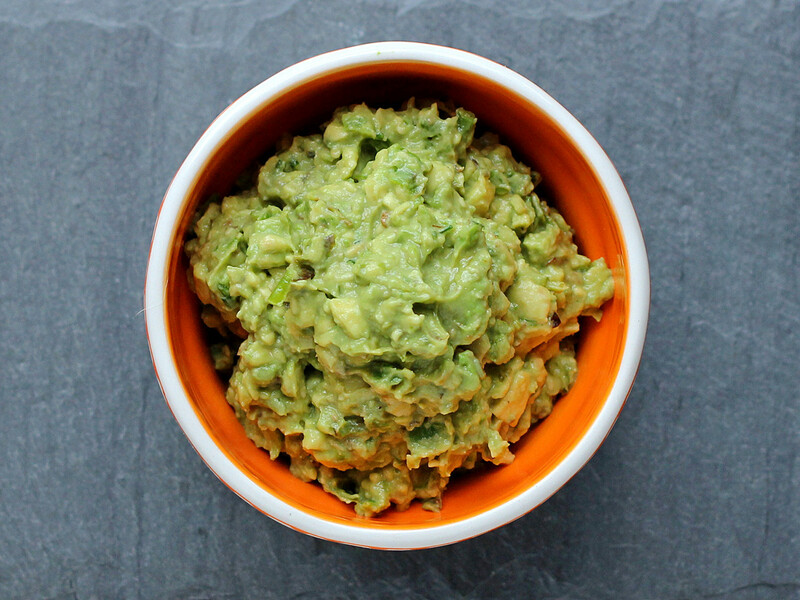 Stir to combine, while chopping and mashing the avocado to your desired smoothness. Taste for seasoning and add more salt or lime juice, if desired. Frieda's Specialty Produce occasionally sends me food items for use on my blog. I'm not required to post. 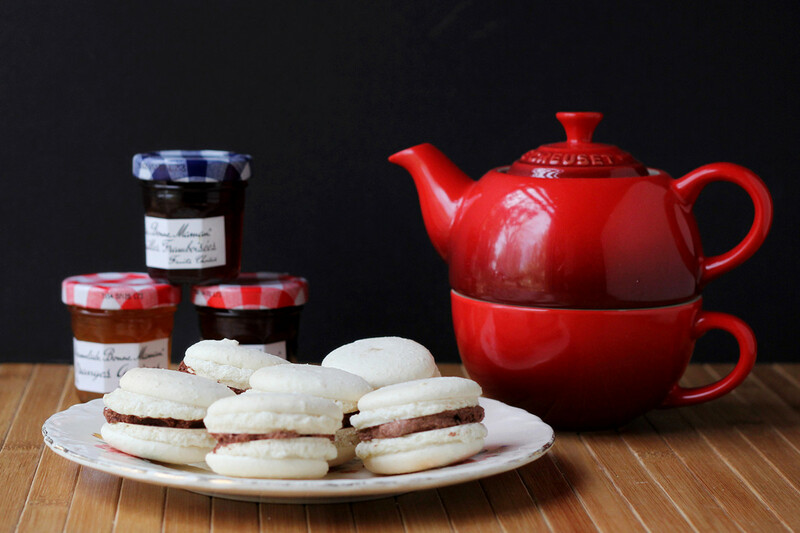 Bonne Maman Jams, a Le Creuset Teacup/pot and home made macarons. Mother's Day is coming, and brunch is traditional for many family celebrations. Even if the meal isn't technically a brunch, daintier foods tend to prevail. And what's more dainty for dessert than a French Macaron? No, not macaroons, with coconut. 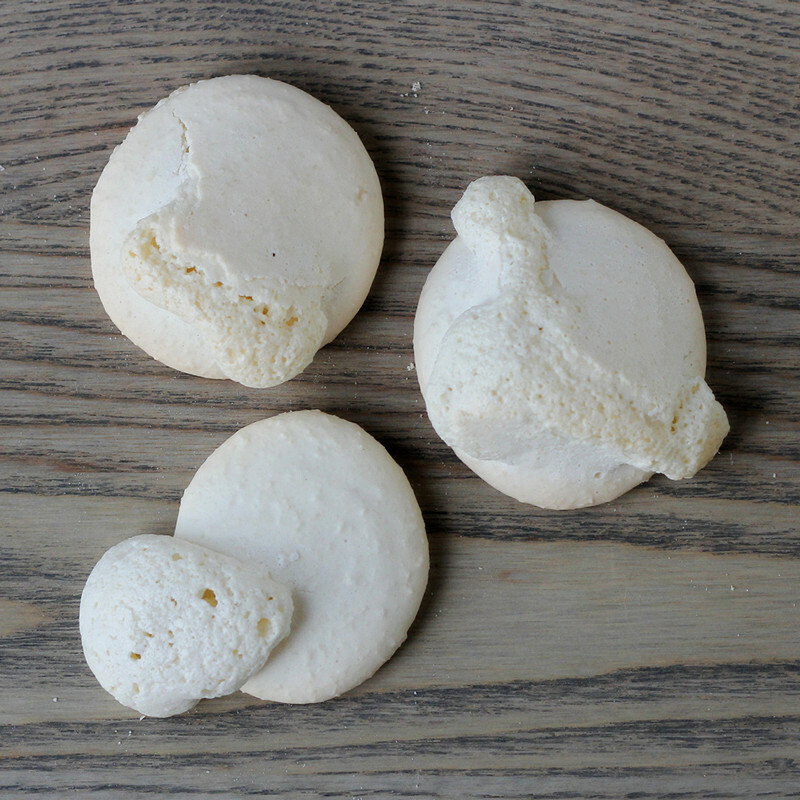 I'm talking about the light, crisp, chewy meringue-related cookies that are French Macarons. The nice thing about macarons is that the flavors (and colors) are endless. Since the basic cookie is nearly white, you can tint them with a tiny bit of food coloring (the Silpat kit I received came with food coloring for that purpose) or you can find recipes that take on color from their ingredients. Like, say, chocolate. Then come the fillings. I used a chocolate ganache for this batch, but buttercream would be lovely, or make your own on-the-fly fillings. How about a nut-butter and jam? Or jam and whipped cream cheese? Or just Bonne Maman jam? Am I saying JAM a lot? Well, that's because there's a giveaway here, where the winners will get a Silpat macaron kit , a gift set of Bonne Maman jam/jelly products, and an adorable Le Creuset stoneware tea for one with a cup on the bottom, and you use the top part to brew your tea, So cute. Won't that be great for Mother's Day? A spot of tea, some English muffins or toast with jam, delicate little sandwiches, and macarons to finish the meal. Oui! 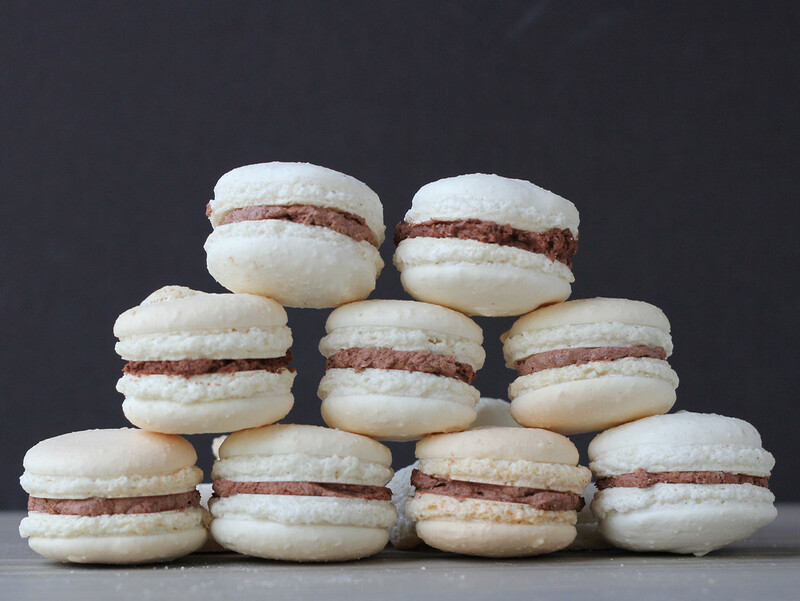 While macaron perfection is a skill I have yet to master, I've made acceptable macarons a few times, and I've made enough mistakes that I think I can point out places where you might go wrong. 1) Almond flour, finely ground. If your almond flour isn't super-fine (like flour) give it a buzz in the food processor, maybe with some of the powdered sugar, until it is as fine as you can get it. Some recipes even suggest passing it through a fine sieve. I made the last batch of macarons with almond flour straight from the bag, and while they tasted fine they were a bit rough on top and the cookies had a different texture than those made with super-finely-ground almonds. 2) Mise en place is your friend. Have all your ingredients ready and standing by. Separate those eggs, weigh your ingredients, and have everything ready to go before you start whipping and mixing. You'll need two bowls, the usual assortment of measuring and mixing tools, and a few specialty items as well, like a piping bag. 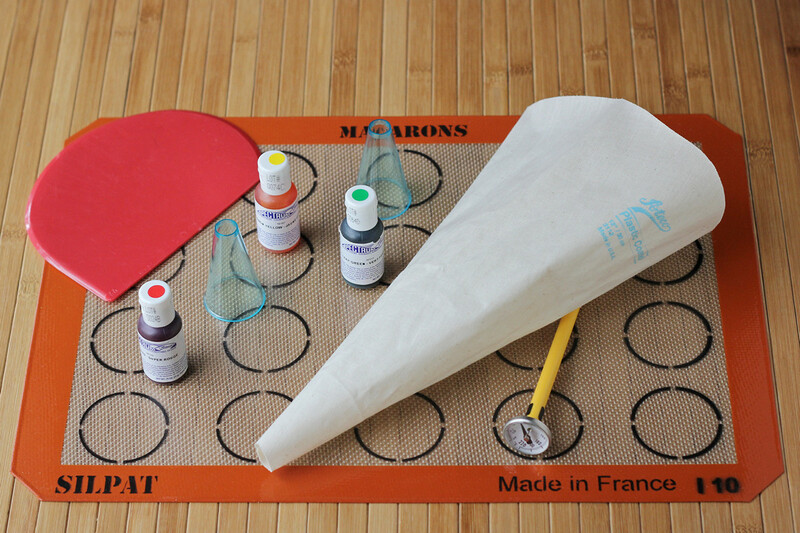 Here's the macaron kit from Silpat , which includes a mat, piping bag, two tips, a pastry brush (not shown), food colors, a thermometer (did I mention that some macaron recipes are fussy?) and a scraper. The kit also includes a thumb drive with recipes. Egg whites are what give macarons their lightness and their structure, so you need to whip them to the proper consistency. If you're using a stand mixer to do your whipping, don't walk too far away from it. Underwhipped egg whites just need a little more whipping. Overwhipped whites can't be salvaged. Some of my macarons rose oddly - tilted to one side or the other - while others were perfect. This was more likely to happen when I was using a recipe that resulted in a thicker batter and I piped in a circle. I got better results when I simply put the tip in the center of the circle I was aiming to fill, and piped straight down and let the batter flow to form a circle. This also helped me form an actual circle rather than oval or odd-shaped macarons. The Silpat Macaron Mat has circles drawn on the mat to make it easy to gauge the size of the macarons and to make perfectly round circles. Those circles would also be useful for cookies or any other food when you're trying to keep them evenly spaced. For the frilly rise to happen along the sides of the cookies, you need to let them sit around after piping until there's a nice crust on top. Depending on how dry it is in your house, this could be quick, or it could take much, much longer. It's possible to over-dry the cookies, but I don't know for sure what horrors would happen if that was the case - I barely have patience to let them dry enough. This is NOT supposed to happen! Some of my cookies had little peaks from piping, and I wanted to get rid of them. To keep my finger from sticking, I dipped it in bit of cold water. This worked really well. I thought. But the tops of those few cookies never dried right, so strange things happened when the cookies baked. These tasted just fine, but there's no way I'd serve them. 6) Bake them long enough - but not too long. Perfectly pale, acceptably toasted, and ... oops! Macarons aren't really supposed to brown. A tiny bit along the edges might be okay, but you don't want your white macarons getting a tan in the oven. 7) No, really, let them cool. 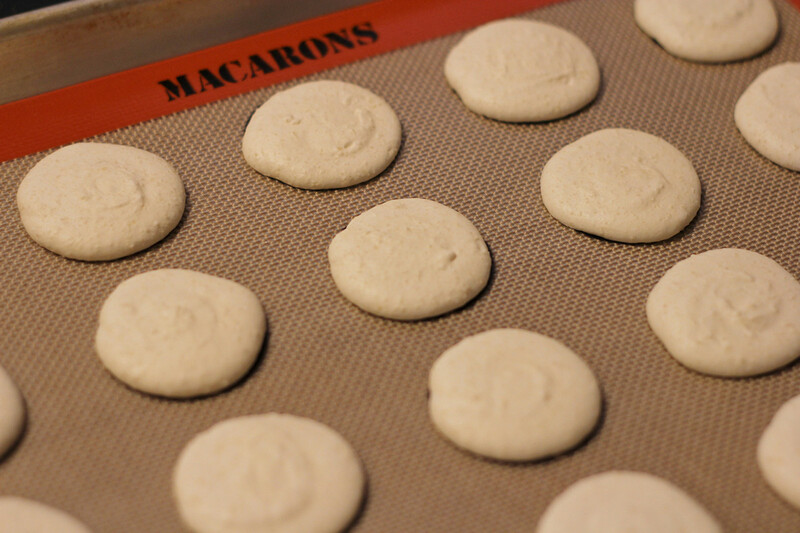 Before the macarons are fully cooled, they will stick to the Silpat baking mat like the suckers on a tentacle. If you try to lift them, you will tear the cookie. So you can't peek underneath. You just can't. But when the cookies are fully cooled, they'll pop right off. Be patient! If it goes wrong, claim that you meant to do that. Seriously, unless you're opening a French bakery, perfection isn't required. You're making cookies for your mom. She'll be happy, even if they're a little lopsided. As for those over-browned cookies - I did that with one batch, and to me the flavor was a little like a toasted marshmallow. I know they weren't supposed to be like that, but I liked the flavor anyway. If all of your macarons are egg-shaped or tilted or over-browned, just smile and serve them. No one needs to know you didn't plan it that way. Just pour a cup of tea, and relax! Thanks to the participating companies for sponsoring these group posts and for supplying product for the giveaway! So far, I've made two recipes from Milk Bar Life by Christine Tosi. One was a lemon bar recipe that started with a box of lemon cake mix. And then there was this herb and spice mix for making a ranch dip. 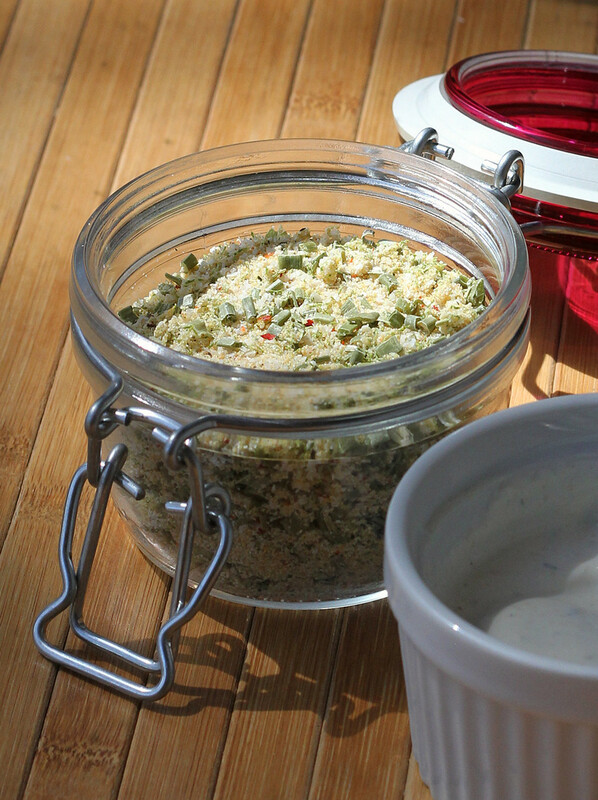 Of the two, I have to say that this ranch dip mix is the one I'm going to make more often. It's just more ... versatile. It can be used to make a dip for vegetables - or for chips, too, I suppose. It can be used to make a salad dressing. And Tosi said that she uses it as a dry rub on chicken and she adds it to beans when she's cooking them. I could see that this could become an all-purpose seasoning for vegetables, sprinkling onto popcorn, mixing into mashed potatoes, or adding to soups or stews. Aside from desserts, I can't think of too many places it wouldn't work. I'll probably be posting the lemon bar recipe a bit later. It's worth having in your back pocket for those times when you just don't want to make a dessert from scratch and you need something to take to that potluck or office party. For a more about the book, check out this review on Munching on Books. This recipe comes from Momofuku Milk Bar, where they apparently were going through vats of Hidden Valley Ranch Dressing before they decided to make their own version. This is astonishingly similar to that dressing, but the lime zest adds a little something different. I never actually made the full dip, so I can't say exactly how that would turn out, but I did use the dip mix added to a much smaller amount of sour cream and buttermilk to make a vegetable dip. Then, I decided to use it to make a salad dressing, and came up with my own formula (below) which I thought was pretty darned good. Combine everything in a bowl, jar, or storage container. Mix well. Note: my dried chives were a little large, as you can see in the photo of the mix. I think next time (and there will be a next time) I will chop them just a little bit smaller, so they distribute a little better though the mix. I have mine in a jar on the counter. The first few days, the lime zest was releasing moisture into the mix and when I stirred it, it was a little clumpy. But now, it no longer clumps - I'm assuming the zest bits have fully dried. 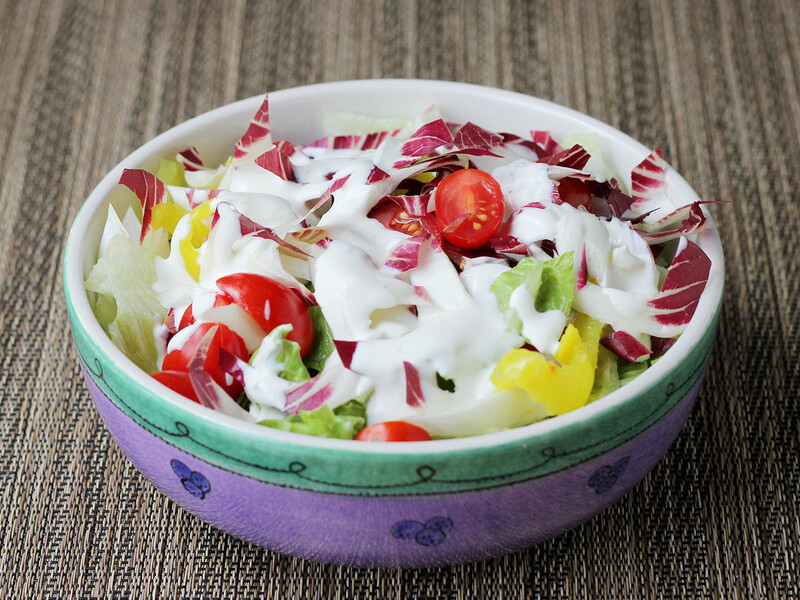 Whisk the sour cream together with the buttermilk in a bowl until smooth. Whisk in the Dry Ranch Dip mix until well combined. Refrigerate for at least 3 hours to let the flavors mingle. Tosi says this is good for up to a week in the refrigerator. To me, it's a lot of dip to go through in a week if I'm not having a party or making salad for a crowd, so I'd suggest making as much as you think you'll need, since the dry mix should have a significantly longer shelf life. Combine all of the ingredients in a bowl or jar. Whisk or shake to combine. Refrigerate until needed. It takes a short while for the ingredients to hydrate and the flavors to bloom, so I suggest making this a few hours or even a day before you need it. With 1 teaspoon of the mix, it was a mild ranch dressing - not very aggressive. If you want more herb and spice flavor, add more of the dry mix until it's to your liking. That's romaine lettuce with treviso (the purple), which looks like a purple endive and tastes like a cross between endive and radicchio, as well as grape tomatoes and Mezzetta Deli-Sliced Pepper Rings. Although I worked with Mezzetta previously, those peppers were purchased by me. The Treviso was supplied to me by Frieda's Specialty Produce. The small jar holding the mix is a Fido jar from Bormioli Rocco; I received several of those for use in an article for another publication. Long, long ago, I worked for a family company that had the bad habit of building its empire by buying similar family companies. Inevitably, we'd acquire one or two family members who were contractually obligated to get a paycheck, but who weren't terribly motivated to work for that paycheck. Those new pseudo-employees were shuffled around to different departments, in the hope that they'd find something they liked enough that they would do the job, and (fingers crossed) that they'd be capable of doing the job. Or at least they'd cause no great harm. I worked in outside sales, and one such wunderkind was shoveled into our department, probably because he liked to go out to lunch a lot, and the powers-that-were thought he could at least take customers along for the meal. I had the un-pleasure of dining with him on several occasions, and whenever he had the chance, he'd order Pasta Puttanesca. Not because he particularly liked it better than other offerings, but because it would allow him to grin creepily and ask everyone at the table, "Do you know what that means?" He was not Italian, nor did he speak Italian, but he had once asked a waiter what puttanesca meant, and was absolutely delighted that a pasta dish was named after ... well, ladies of the night. And he gleefully shared that knowledge with whoever was dining with him. The story is that the ladies in question would make this dish because they could make it fast, which allowed them to get back to work quickly. But of course, he didn't care about the story. He just loved translating the name (usually in cruder terms) and gauging the reactions of people at the table, hoping for shock or horror. Yup, that's the guy you want representing the brand. Back then, I just rolled my eyes and said yes, I know. These days, I'd probably conspire with a waiter to invent a dish named after men with small noses. No matter what the name, the dish still holds up as a quick and tasty meal. This version comes from Patsy's Italian Family Cookbook by Sal Scognamillo. Patsy's is an Italian restaurant in New York, and the recipes are what you'd expect from a restaurant serving the classics. 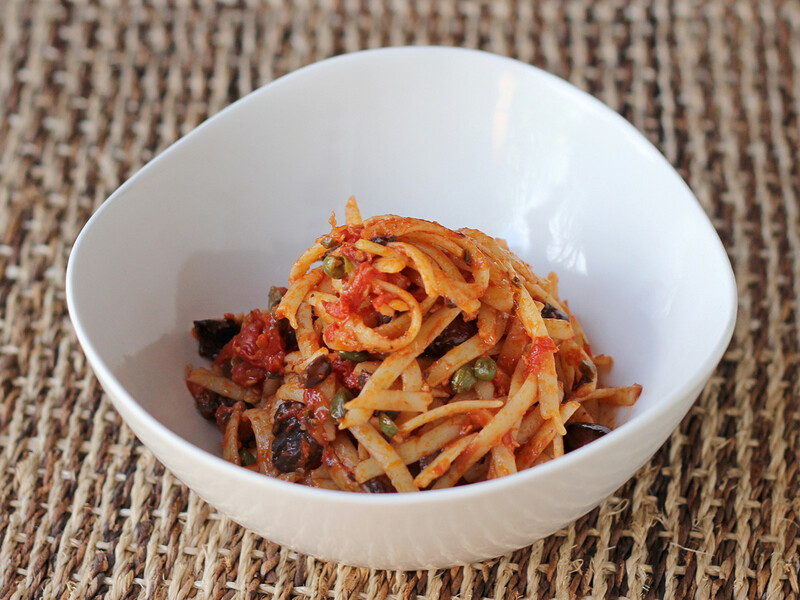 The recipe is actually for Linguine Puttanesca, but I've also had it with spaghetti. Use what you like. I didn't have the anchovies in oil, but I did have anchovies in a tube. I just eyeballed the amount. 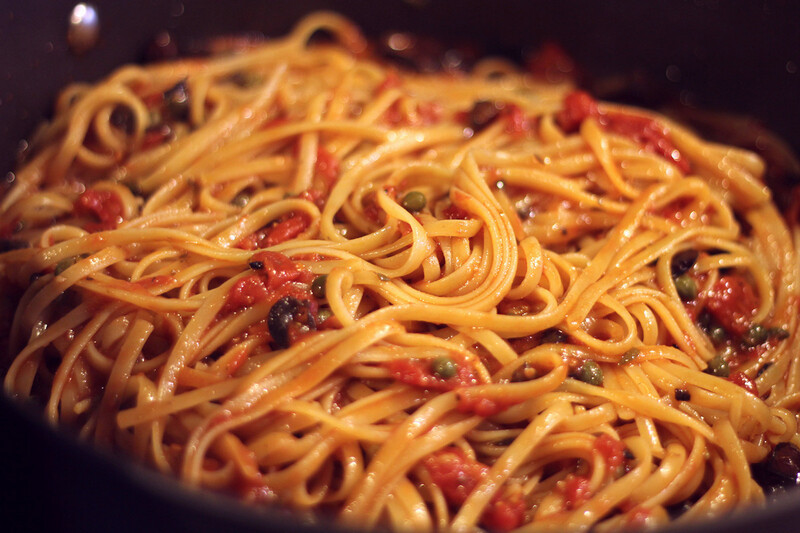 Get the water boiling and cook the pasta while you're working on the sauce. Heat the oil and garlic together in a large, deep skilled over medium heat. Stir very often until the garlic is just turning golden. It can burn in an instant. If it does, toss the garlic and oil and start over. Pour the juices from the tomatoes into the pan, then crush the tomatoes with your hands as you add them. Bring the mixture to a boil, then add the olives, capers, anchovies, and oregano. Reduce the heat to medium-low and let it simmer until it has thickened, about 20 minutes. If the linguine hasn't cooked to al dente by this time, set the sauce aside. The book suggests draining the pasta, reserving 1/2 cup of pasta water, and adding the sauce to the pasta along with the reserved pasta water. Instead I transferred the pasta to the sauce, then added pasta water. Do whichever you think is easier. Bring the pasta and sauce to a boil over high heat. Taste and add salt and pepper to taste - you might not need a whole lot of salt since you have olives, capers, and salty pasta water already. Serve hot with cheese on the side to add as desired. *I used anchovy paste from a tube and eyeballed the amount. I received this book from the publisher at no cost to me. I recently reviewed Mastering My Mistakes in the Kitchen over on Munching on Books, but I wanted to share a recipe as well. These brownies were super-fudgy, just like the recipe said. They're rich and dense and soft and chewy and ... well, fudgy. Make sure you use chocolate and cocoa powder that you like, because the flavor really comes through in the brownies - I mean, there's a lot of chocolate in there. The original recipe called for cocoa nibs as an option, but I omitted them, even though I happened to have them. Next time, I might add nuts - probably walnuts - since those are one of my favorites in brownies. 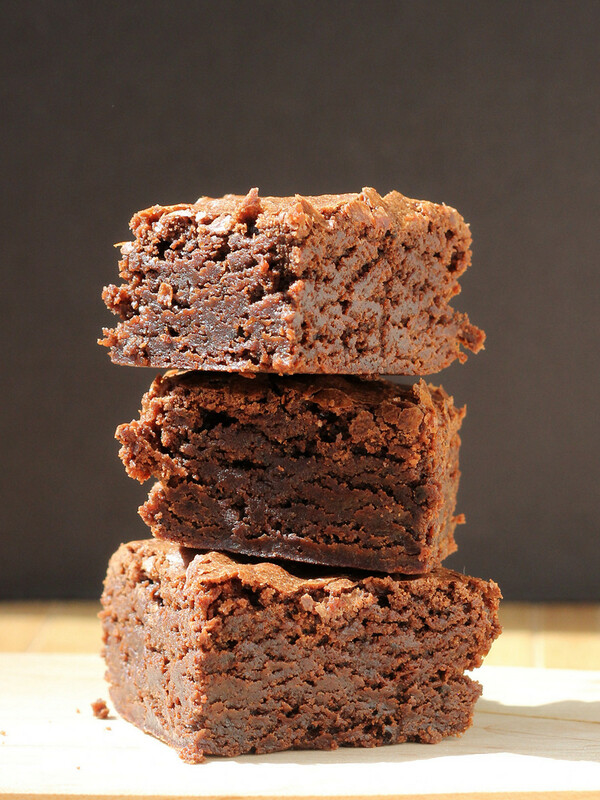 These make a reasonable-sized batch - just an 8-inch square pan - but I suggest you cut them into small pieces - 4x4 to yield 16 brownies instead of 3x3 to yield 9 larger brownies. Give them a try - I think you'll like them! 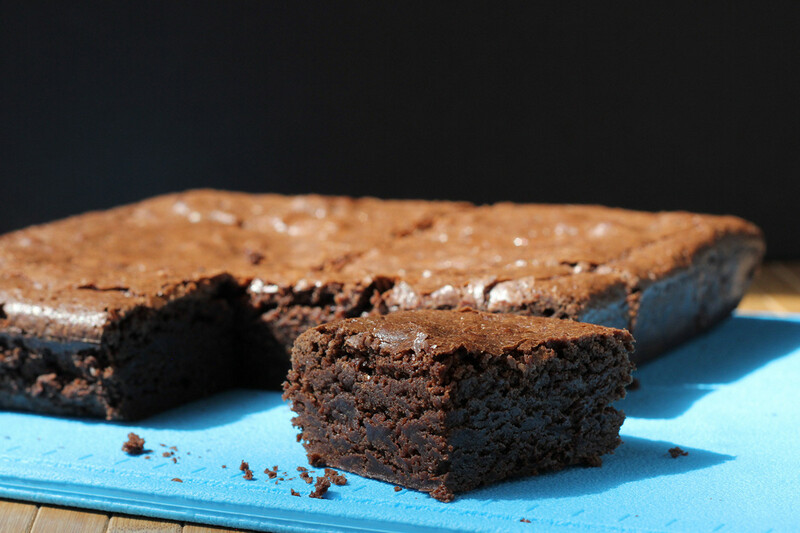 Heat the oven to 350 degrees and line an 8-inch square baking pan with parchment paper, leaving a 2-inch overhang on 2 opposite sides - this makes it a LOT easier to remove the baked brownies from the pan. Sift or whisk the flour, cocoa powder and salt together in a medium bowl. Melt the chocolate and butter in a double-boiler, or a bowl set over a simmering pan of water. Stir until they're both melted and combined. Place the bowl on a towel to catch drips. Whisk in the sugar, then let the mixture cool a bit before adding the eggs and vanilla. Whisk until smooth. Fold in the flour mixture. The book suggested optionally adding 1/4 cup cocoa nibs. I'd be more likely to add nuts, but left mine plain. Transfer the mixture to the prepared pan. Tap the pan on the counter a few times to release air bubbles. Bake, rotating the pan if needed, until a toothpick inserted in the center comes out with a few fudgy crumbs attached - if it comes out completely clean, you've probably overbaked. It should take 40-45 minutes. Remove the pan from the oven and let it cool on a rack until they're completely cool. Use the parchment ends to remove the brownies from the pan. Cut into squares to serve. I might have mentioned - like a billion times now - that I really like polenta. And grits. So this time around, I decided to throw some peppers into polenta. I had just gotten a rather large bag of shishito peppers from Frieda's Specialty Produce, and I had a tube of their polenta as well. Their polenta is shelf-stable at room temperature, which is great if you want to stock up. It's meant for slicing and frying, but I like soft polenta a lot, so that's usually the direction I go with it. This recipe is super-easy, and the results are really tasty, The flavor actually reminded me just a little bit of tamales, but not so much that you couldn't serve this with any other cuisine. Or, for me, just a bowl of polenta for breakfast. Remove the stems and seeds from the shishito peppers and dice. Heat the oil in a skillet and fry the peppers until they're fragrant and a little bit softer. Set aside. Remove the polenta from the tube and cut or break it into pieces. Add to a saucepan along with the water. Heat on medium, stirring, then whisking, the polenta until all the pieces are broken up and the polenta is smooth. Add the half-and-half, cheese, and peppers. Continue cooking and stirring until the cheese is melted in. If the polenta is too soft for your taste, continue cooking until it thickens to your liking. If it's too thick for your taste, add more water or half-and-half. I receive food items regularly from Frieda's Specialty Produce at no cost to me. You can find their products at your local grocery store. This post is helping to pay the bills - it's sponsored by GE appliances, but all commentary is my own. GE is sponsoring blog posts and videos with the theme #MyAmericanKitchen, where everyday people are talking about kitchen memories. This is my contribution. Growing up in a very small apartment, I was never very far from the kitchen. Most of the time, I was right there at the kitchen table coloring in a book or doing crafts or doing homework or reading a book. And the living room was the next room. There really was no way to escape the sights, sounds, and smells of the kitchen. While I sat at the kitchen table, my mother would be a few steps away (did I mention that it was a tiny kitchen in a tiny apartment?) and she would be stirring a sauce or chopping vegetables or wiggling the leg of a chicken in the oven to see if it was done. While she was cooking, she'd ask me to taste things - a tiny nip of tomato sauce, or a spoon full of soup. And she'd ask me if it tasted okay, or if it needed something. I'm sure that at the beginning I wasn't much help, but as I got older I'd suggest more salt or oregano or that it needed to be more tart or sweet. My very first actual "cooking" memory is of me standing on a chair in front of the stove, melting butter in a tiny pot for popcorn. It was serious work. As I got older, I became involved in more hands-on tasks. Soon, I was allowed to monitor the counter-top grill (I'm pretty sure it was a vintage GE appliance) that was used for steaks, and I was set to work ripping lettuce and making salad dressings. I became an expert at making deviled eggs. And when we got our first blender, I had fun making milkshakes and pancake batter. Eventually, I got tall enough to stir things on the stove without needing a chair to stand on, which also meant I was tall enough to stand on a chair to change a ceiling-fixture light bulb - which oddly also had the same decorative GE logo. After all these years, I can't say for sure which of mom's big appliances and countertop electrics were GE appliances, but I know that quite a few of them were, because. I remember the logo from when I was very very young. It was years before I knew that scrollwork inside the circle were actually letters - to me, it was just a pretty design on a badge that I could trace with my finger. After a whole lot of years hanging around in the kitchen, when I left home I had learned how to cook without recipes. I could throw together a pot of soup or stew, or grill a steak, or roast a chicken or make a salad dressing, or cook an entire Thanksgiving meal without looking at a recipe. I guess there were some advantages to living in a tiny apartment. I never had cooking lessons, but I couldn't help but learn when it was right there in front of me all of the time. A few years ago, my husband and I needed to replace the hood over the stove that came with the house we bought. After some careful consideration, I decided we needed more than a hood - we needed a GE Profile oven. 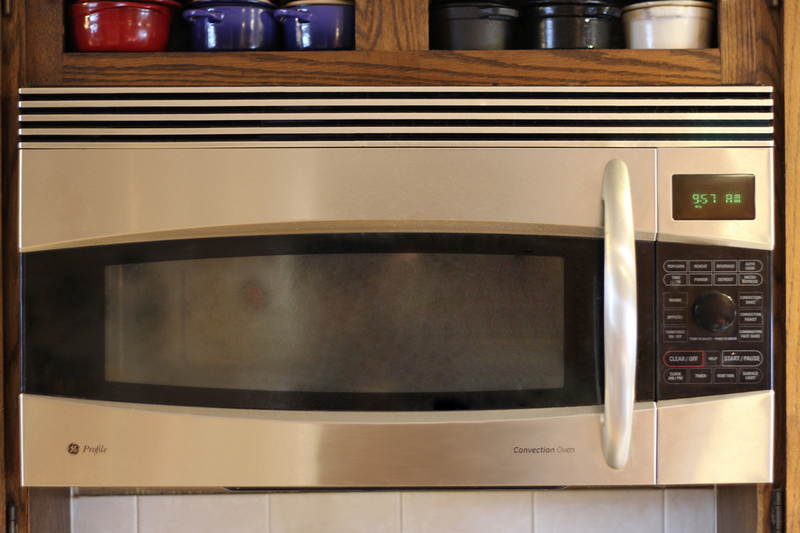 It's a microwave and a convection oven, and it also functions as a stove hood with a light and vent. It even has a nightlight. 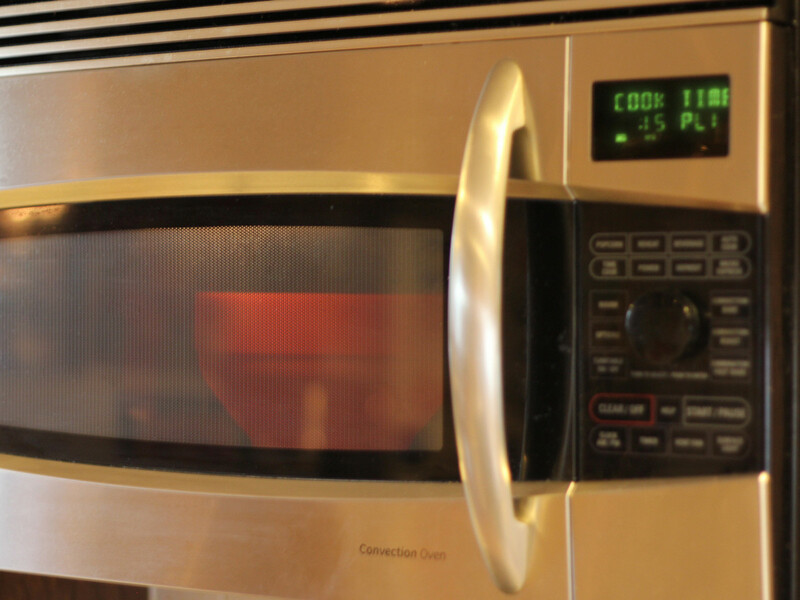 The funny thing is that my first cooking memory is about popcorn, and one of my favorite uses for that GE Profile oven is to microwave popcorn - it's consistent and it's easy and I can cook with little or no oil - or more oil. Or butter. Whatever mood strikes me. But it's not just for convenient snacking. I use it every single day for something. More than once this dual-purpose appliance has saved my bacon ... like the time when some parts of a dinner were done wayyyyy too soon, and I was able to put the finished items in the oven on a "warm" setting while I waited for the stragglers. And the company we were feeding never knew that I hadn't planned it that way all along. Want more GE in your life? 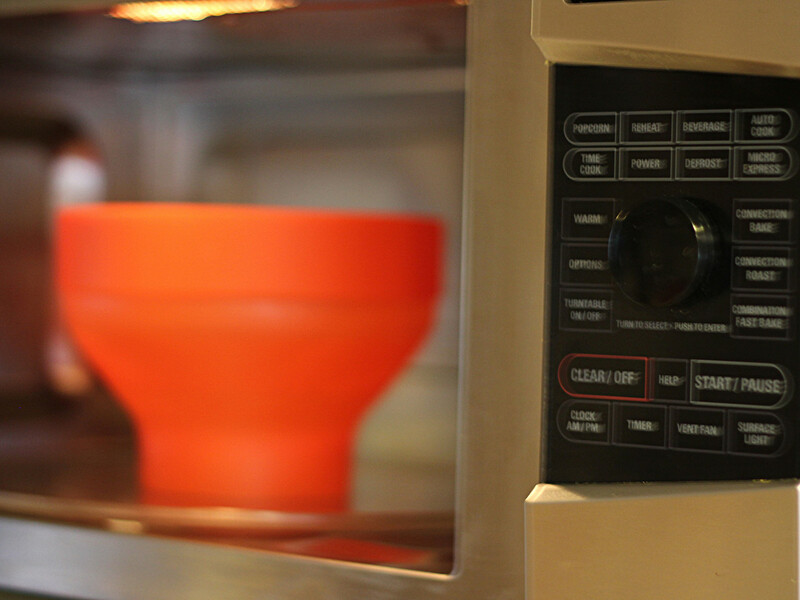 You can follow GE Appliances on Twitter (and find them on other social media) at @GEAppliances. Look for the hashtag #MyAmericanKitchen for more kitchen stories, nostalgia, and how folks are creating new memories every day. Check out the Richards family story about their adopted children and learning about culture through food. There will be more videos to come. Watch the videos at GEappliances.com. This is a sponsored conversation written by me on behalf of GE Appliances. The opinions and text are all mine.